''Mr Right & Mrs Always Right'' Wine Bottle Stopper and Opener Special Gift Set By Haysom Interiors by Haysom Interiors at Verve Wine Bar. MPN: NA. Hurry! Limited time offer. Offer valid only while supplies last. 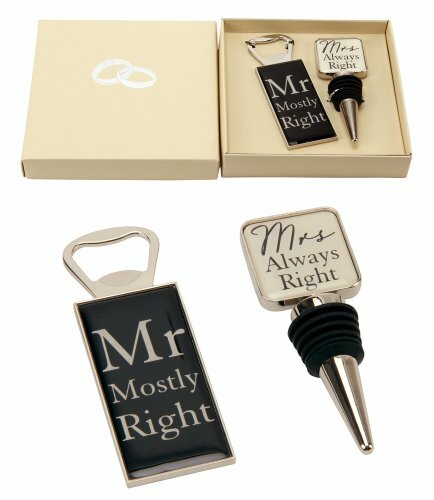 "Mr Mostly Right" bottle opener and "Mrs Always Right" bottle stop. This would make a lovely and unique wedding/anniversary gift or a little something to treat a loved one. Supplied in a beautiful cream presentation box. Presentation box measures 4.5" x 4.5". Multiple matching items available in our "Mr & Mrs" range. If you have any questions about this product by Haysom Interiors, contact us by completing and submitting the form below. If you are looking for a specif part number, please include it with your message. By Dkb Household Usa Corp.
Wine Aerator and Wine Saver Pump with 2 Vacuum Bottle Stoppers by Barvivo - Pour, Aerate, Enjoy and Preserve Your Red Wine, it Will Taste 3 Times Better Than Originally and Stay at its Best for Days.